We are proud to announce the introduction of our newest member of the Challenge cutter family. 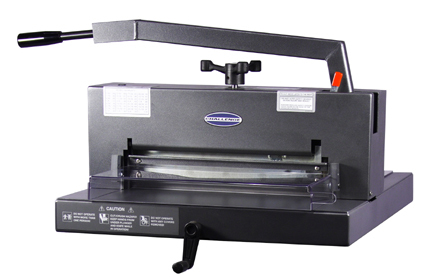 The SPARTAN 150 M Paper Cutter is a sleek strong 15″ table-top machine perfect for the professional office, copy center, in-plant, and on-demand printing environment. Holding true to our tradition, the Spartan 150 M is engineered and manufactured to the highest of safety standards available in the world. Safety shields cover the front and rear tables. Clamping: Manual – Hand-Crank. The hand-crank design for clamping creates a much higher clamping force than the lever design which results in a better quality cut. LED Digital Backgauge Position Indicator with ±0.01” (±0.1mm) Backgauge Accuracy – provides for easier operator interface, higher productivity, and easier repeatable accuracy than a hard to read indicator on a scale as is used in other brands. Laser Red LED Cut Line Light – produces a very sharp, easy to see cut line without the replacement problems of incandescent bulbs. Front Safety Shield interlocked with the cutting lever – provides protection for the operator during operation. Heavy-Duty Steel, Cast Iron, and Cast Aluminum Construction give the cutter the “Challenge” durability. Consumable supplies (knives, sticks) retail for approximately 30% less than the major competitive brands.